Full screen WordPress theme is specific. It always occupies all screen space, regardless of screen size. Making an eye pleasant design throughout all screen sizes is now easily achievable. Hot Bokeh has been designed to use the full screen space, regardless of the screen size. We did our best to make it look good on both smaller screens and also on gigantic screens. All elements of the full screen WordPress theme, including images, fonts, menus, etc., are designed to perform well on all screen resolutions. A pleasurable user experience is something that Hot Bokeh would bring to your visitors, no matter how they are accessing your WordPress site. The full screen WordPress theme can be used for development of websites for all purposes. Its design is clean and modern. But, at the same time, it’s neutral. This theme comes with 10 (ten) different color variants. One of them would probably match your company’s design guidelines or your personal taste. 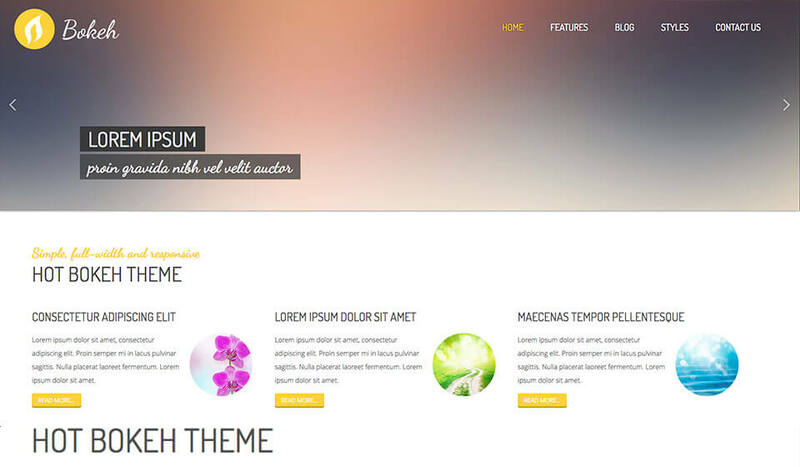 This theme is equipped with several plugins by HotThemes. The main role on the home page is given to Hot Full Carousel – responsive carousel WordPress plugin. 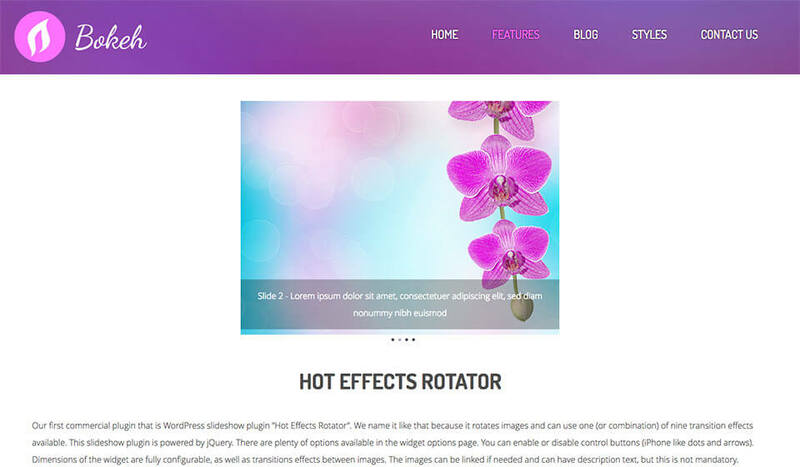 Beside this plugin, the theme also includes WordPress slideshow plugin – Hot Effects Rotator. It’s good to add precise map on the contact page. 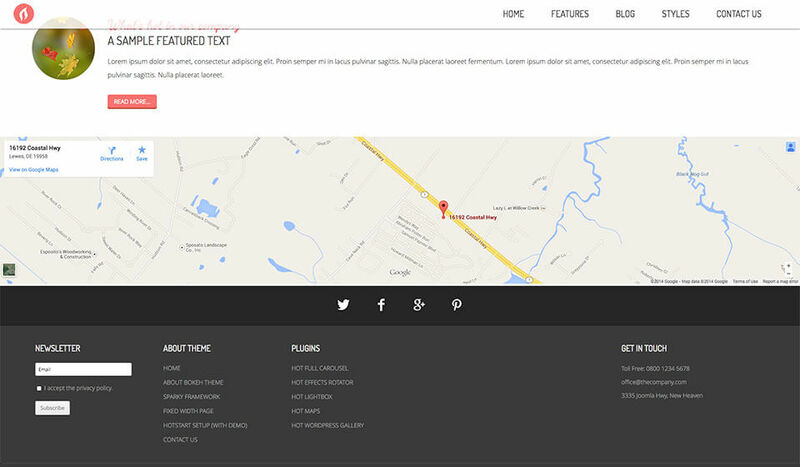 That’s why we included WordPress Google Maps plugin – Hot Maps. Finally, Lightbox plugin and Hot Gallery can be used for making photo presentations on your site. All these plugins are included without additional fees with the full screen WordPress theme. This is a responsive theme. It’s based on a valid and clean CSS code and powered by Sparky Framework for WordPress. All colors of the theme are easily customizable from the theme options. You have unlimited color options. 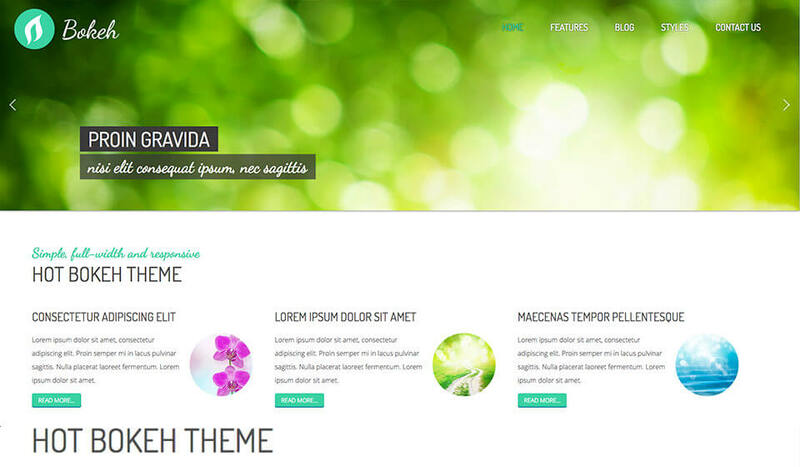 This theme has the largest number of pre-defined color styles of all our themes! Customization of the theme’s layout and adding/removing widget positions is easy. It’s powered by Sparky’s drag and drop Layout Editor. Change layout and element’s dimensions easily wherever you need. 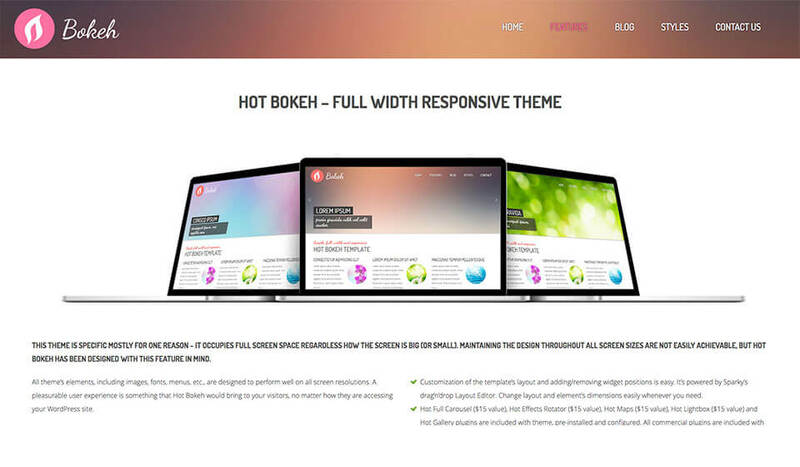 Hot Bokeh is a responsive WordPress theme. This means it will look good and optimized on all desktop and notebook computers, as well as mobile devices (tablets and smartphones)! 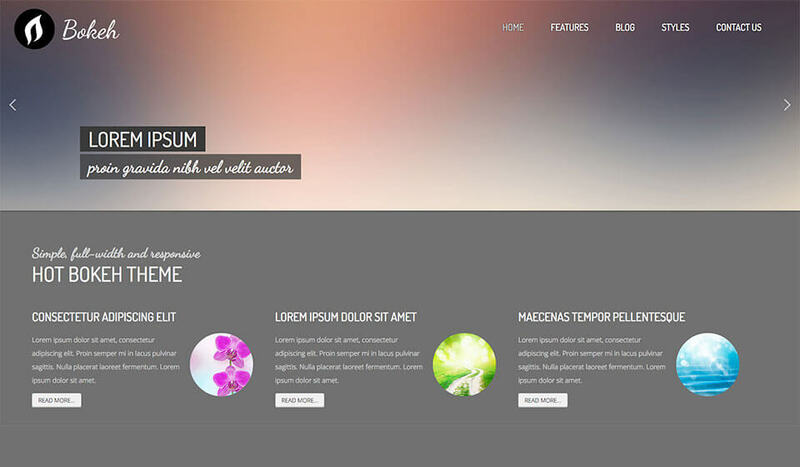 Layout Builder is where you create layout for your website in few simple steps. Click “Add Row” button to make some rows. All widget positions and special elements are represented as cells. Drag some of them into the rows. Add specific name and/or class to any row to select it and style it through CSS. 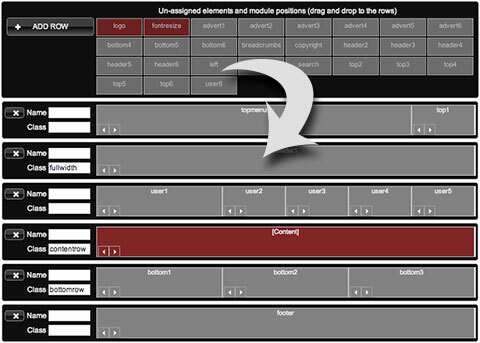 In the background, Sparky creates layout fully automatically according to the settings from the Layout Builder. 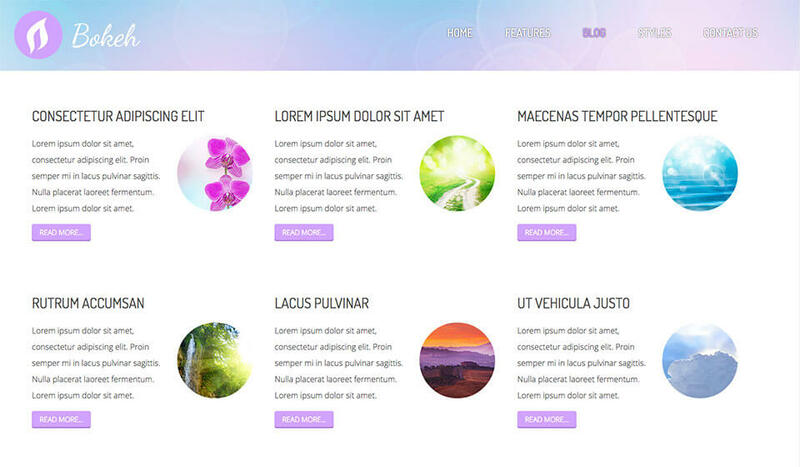 Learn more about this WordPress theme framework. This theme is shipped with demo data. If you follow our simple instructions and install the theme with demo data, you will get a pixel perfect copy of our demo site. All themes found on this site are tested thoroughly using the latest WordPress version. Any discovered incompatibility issues will be fixed as soon as possible. Our products are well-documented, but if you run into the problems with theme installation or usage, simply post your question and our support staff will help. 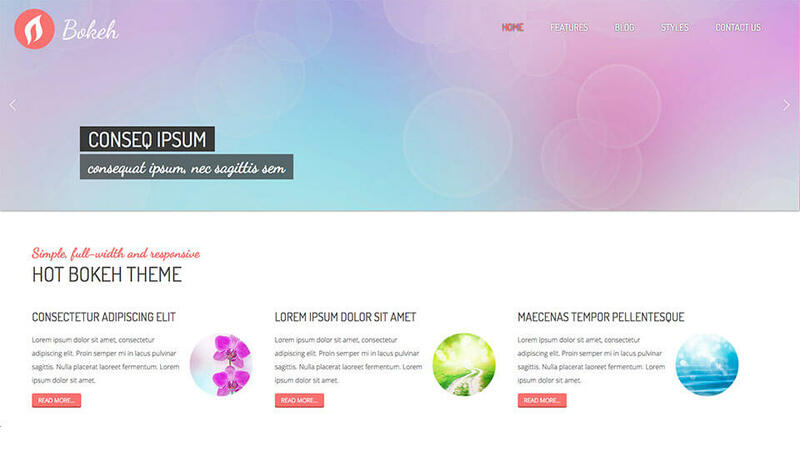 This theme is based on a clean and valid HTML and CSS code. We tested it using the W3C validation tool to make sure it’s 100% free of errors. This theme is shipped with PSD files and fonts. If you need to modify our design or any part of the theme, it can be done in Photoshop, using the source files. This theme is shipped with sets of .mo and .po files that can be used to translate the theme. Also, the theme works with RTL languages. All the plugins that you can see on the demo are included in price. If you install theme with demo data, all plugins will be installed as well. This theme contains a lot of positions where you can place your WordPress widgets. The detailed “map” of all widget positions is available the theme options panel. 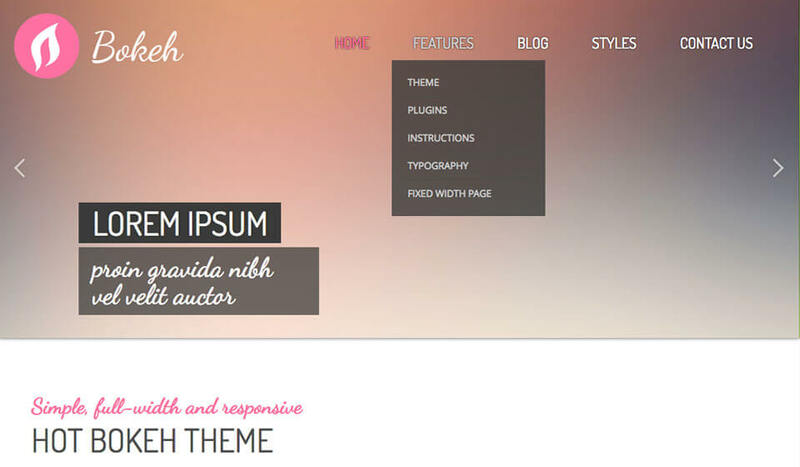 This theme has integrated top menu script with support for multiple levels. Sub levels are displayed as drop-down panes. The menu script is based on jQuery.